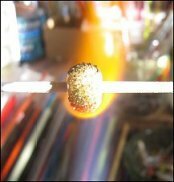 ~ If you are curious to see how I melt glass rods to create a bead in the torch, please click on the link to see detailed photos and a step-by-step write up of me making a basic bead. 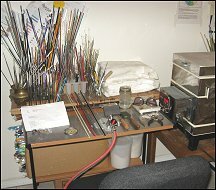 ~ The editor of GlassLine magazine asked me to prepare an article for publishing in the on-line April/May 2007 issue: "A Beginner's Guide to Setting up a Basic Bead-making Studio" . The editor thought it would be valuable to newcomers to the world of beadmaking, so the article is available to the public - the link above will take you to a .pdf version of the article and can only be viewed - if you would like a printed copy, please contact GlassLine magazine to order a copy of the issue directly. 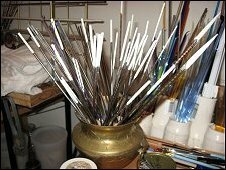 ~ I often get emails from new beadmakers describing various problems they are having with making beads, especially with trying to get the beads to come off the mandrel, or with stopping the bead release from breaking during the creation of a bead. Click on the link above to see my tips and ideas for solutions.